Well, I saved what I thought was going to be the best for last. 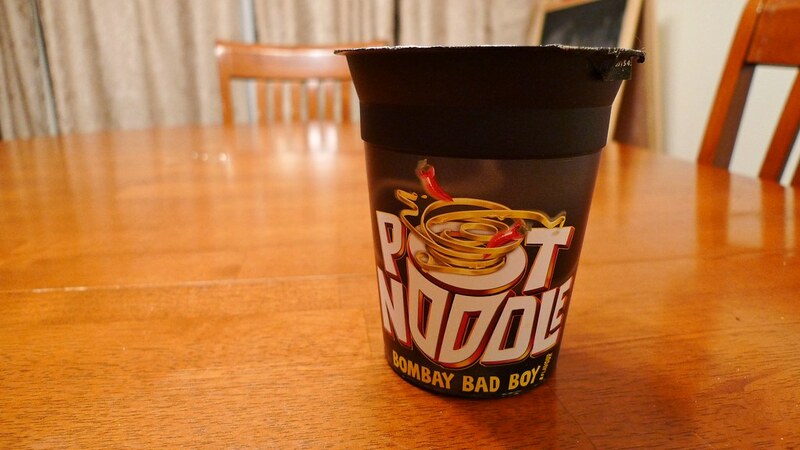 Pot Noodle's Bombay Bad Boy is my last pot noodle I received from my friend in England. Will it be my favorite of the bunch? Click 'Read more' to find out. With family, work, website, podcast, and commuting taking up all of my time, I cannot update this site anymore. I have about 10 posts in draft that I will probably never finish. If you are a subscriber, thanks for sticking with me this long, but I will be going on a permanent hiatus. What does that mean? It means I'm pretty much done, but wouldn't say that I will never ever come back and continue. It's just highly improbable. Plus, this guy is doing pretty much the same thing and does a better job of updating (though I wish he would get into more detail). I know I've been neglecting this blog lately and I promise that I haven't forgotten about it. Truth is, I have a few reviews in draft, but I just don't have time to touch them up and post them. I've been busy watching lots of movies, taking lots of photos, and working on my new podcast. I've stated my complaints against phở restaurants in Seattle on this blog before, but that doesn't mean that there aren't any decent places to grab a bowl of the rice noodles. I have not been to any of Harmer's favorite restaurants before, but am now curious about trying them. If I ever do try them out, and get back to writing on this blog again, I'll be sure to share my experiences. Nick Harmer's article can be read here on Drowned in Sound. Golden Wonder The Nation's Noodle - Sweet & Sour. 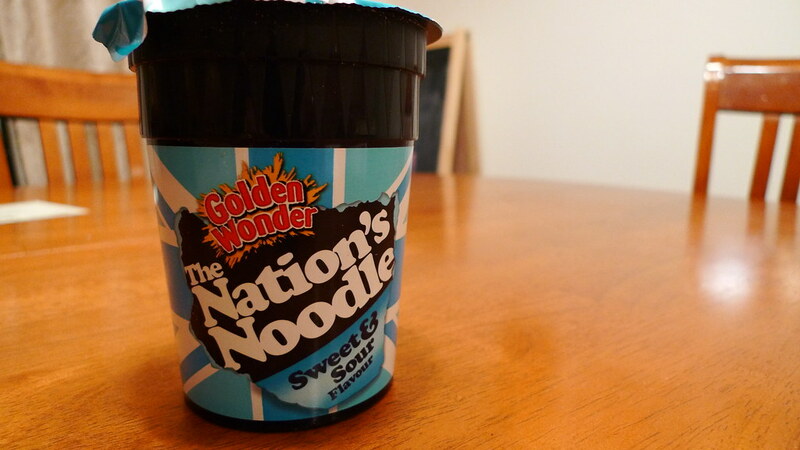 Here is the third pot noodle I received from a friend in England. I sort of tried these in order of what I thought would taste the worst to what I thought would taste the best. I expected The Nation's Noodle's Sweet & Sour to be fairly tasty. Was I right or wrong? Read on to find out. Man, I wish we had something like this here. Quality doesn't look very good, but the machine looks a little dated and the price is only 300 yen ($3.69). I wonder how it tastes. 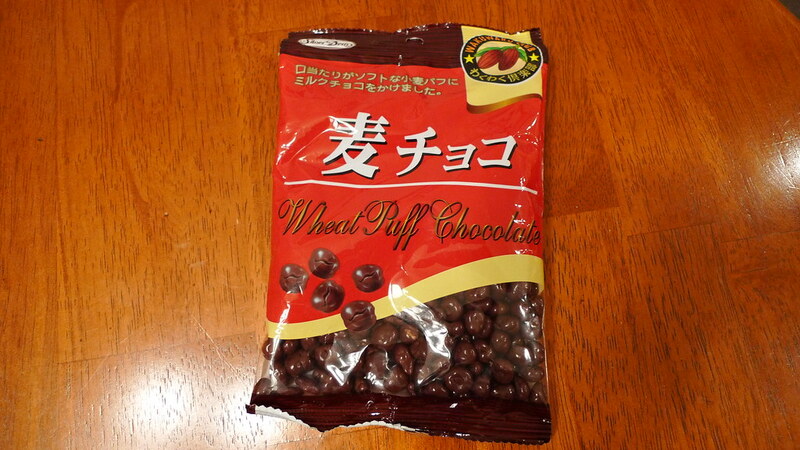 Wakuwaku Club Wheat Puff Chocolate. I read a favorable review on wheat chocolate a while back and have been wanting to try it ever since. I had never even seen or heard of it before, which is surprising because I'd like to think that I'm in touch with Asian snacks. I finally got the chance to try some a couple months ago and if you want to know what I thought, continue reading my review. NHK's Cool Japan showed a video on how it is possible to replicate the high quality tastes of ramen from ramen restaurants for instant noodle packages. The development manager is an interesting chap as he can replicate ramen simply by smelling it, tasting it, and jotting down notes of what he thinks is in it.